For the weekend, Evan and I went to Niagara Falls. 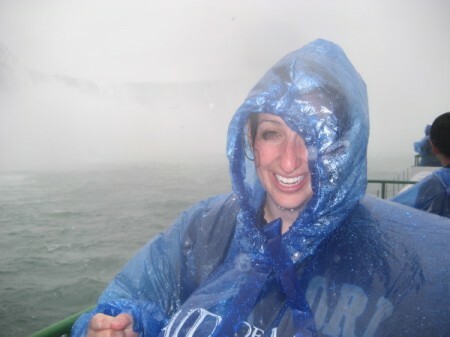 I’d never been there before, so I was really excited to see the falls — and to return to my homeland, Canada. 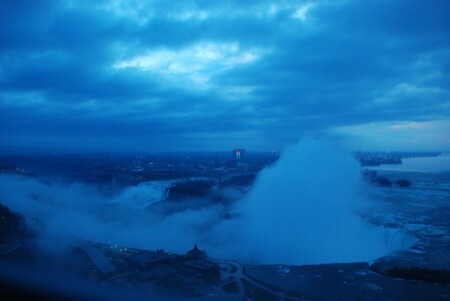 We had a great room on the top floor of the Sheraton Fallsview that had an incredible view of both the Canadian and American falls. We were just glued to the window every time we were up there. We of course did the requisite wander by the falls, and we rode the Maid of the Mist — a boat that takes you so close to the falls you are completely enveloped in its mist and can’t really see anything. It felt like being hit by a giant storm at sea. Everything got soaked and it was so windy it was hard to keep my eyes open. And I only realized after I was drenched that my mascara wasn’t waterproof. Oops. The ponchos they gave us helped, but our pants, shoes and sleeves still got pretty wet. Once we were done with the touristy falls sights, though we ventured toward the very quaint and charming Niagara on the Lake. We stopped at the botical gardens and butterfly conservatory, which was fantastic. The gardens weren’t in bloom yet, but there were tons of butterflies flying around in the indoor garden, which just created a magical experience. I tried to capture it on video. 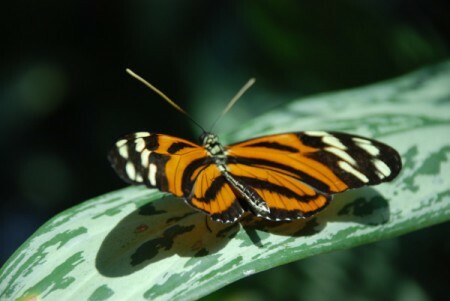 Evan also took some great photos of the butterflies. In Niagara on the Lake, we had tea and scones at the Irish Tea Room, and the night before, we had a wonderful dinner at the Stone Road Grille. 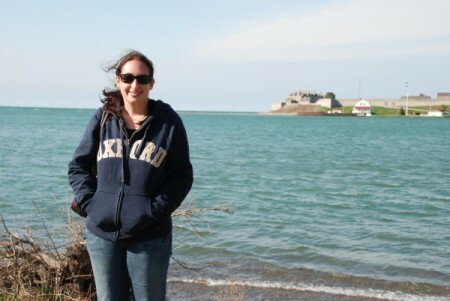 We wandered around the cute shops on the main strip, bought some cookies, and checked out Lake ontario. We could JUST make out Toronto in the background. We also found out that Niagara has a wonderful wine country, so we went to the Peller and Hillebrand vineyards for some wine tasting. They both had excellent chardonnays, geverztraminers and ice wines and we bought a couple of bottles to take home — apparently you can’t get much Canadian wine in the U.S. at all.